Check out the MYO Armband, making the science fiction of your dreams a reality, this device is the real deal in gesture driven computer control. 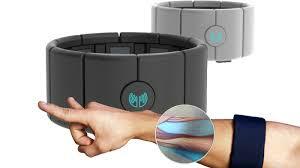 The MYO Armband is worn on your forearm and works by picking up electrical activities in your muscles (the ones that work your fingers and wrist) as they make gestures, translating that movement into computer commands.How cool is that? The most outstanding difference between the MYO Armband and Kinect or Leap motion controller is that instead of waving and jumping around with exaggerated movements in order to be picked up, the MYO Armband can also detect very fine movements, like that of a surgeon, and even the simplest and most subtle finger movement can be read just as easily as a sweeping hand gesture. Gestures, you say? You guys should check out the Kreyos Meteor, currently on indiegogo. It’s a smartwatch which can control your phone or laptop (planned feature which would be hurried with 1.5MM stretch goal, keynote/presentation control using gestures). check it out, less than 20hours to go on the campaign.